The video is from my sister Pens Fan’s iPhone, so it’s not the best quality, but seriously, the cutest thing you probably will see at a Pirates game in a long time. 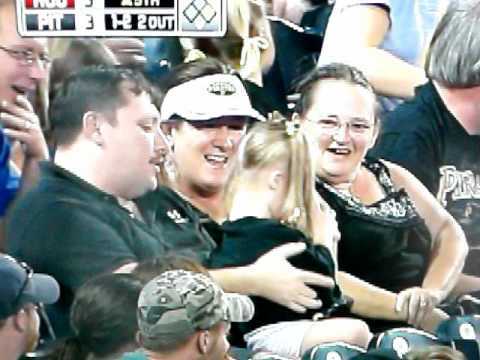 I love the man who caught the ball from the foul-ball fielder and gave it to the girl. I love the way she gazes at the ball at the very end. Being a pregnant woman I am highly vulnerable to such things. Now I’m all weepy at my desk. Darn you. Touched :-) Such an inspirational gesture of kindness! It’s really the little things, is it not? Love this. It made me cry. This made me cry, too. Thanks for sharing. OMG I know that family! Went to high school with the father. I’m sharing this with them via FB.